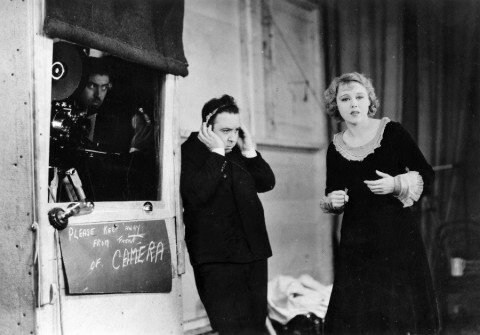 Above we have a young Alfred Hitchcock on the set of Blackmail (1929), conducting a rather naughty sound test with actress Anny Ondra (1929). In case you don't know the backstory, Blackmail was originally meant to be a silent film. However, with talkies becoming the rage, Hitchcock decided mid-stream to make the film a talkie. That decision didn't come without its own problems. Anny Ondra, a Czech actress, spoke English with a heavy accent and couldn't pass as a Londoner in the film. So Hitchcock performed some cinema magic and had English actress Joan Barry dub Ondra's lines. In those days, dubbing couldn't take place in post-production. It all had to happen in real-time. Thus, as the camera rolled, Barry stood outside the frame and spoke the dialogue into a microphone, while Ondra pantomimed the words. Throughout, Hitchcock directed Ondra while listening to Barry through a pair of headphones. You can watch Blackmail (Britain's first talkie feature film) online here or find it in our collection of 23 Free Hitchcock Films Online.